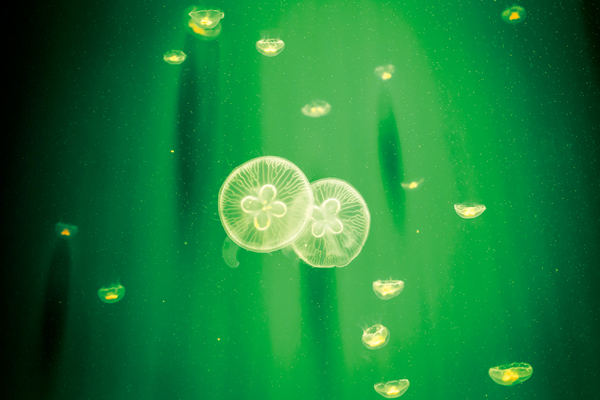 Did you know that 94 percent of life on earth is aquatic? That makes us land dwellers quite a small minority. 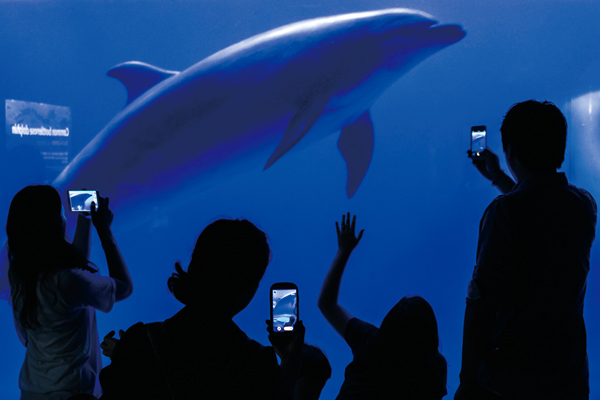 Luckily, though, there are aquariums like Han-wha Aqua Planet Jeju that allow people to view and learn about many of the fascinating species which inhabit the ocean depths. Aqua Planet is in Seongsan-eup, Seogwipo City, just south of Seongsan Ilchulbong (“Sunrise") Peak. It opened in the summer of 2012 and it takes around 90 minutes to see all of the nearly 48,000 animals and 500 species of plants at this premier attraction for tourists and locals alike. A clean, modern and spacious atrium, the Central Court greets visitors upon entering the 25,600 m² Aqua Planet building. Giant manta ray sculptures hang from the ceiling in front of a beautiful open view of the ocean and from here you purchase tickets and proceed to the heart of the aquarium. Vividly colored fish and corals in the large Munseom Island water tank welcome visitors at the ticket entrance. Next, make your way past five uniquely shaped tanks with island themes from Hawaii to Bali. Then there are the sepa-rate walrus, harbor seal and penguin viewing areas. Throughout the aquarium, the hallways and displays accommodate pedestrian traffic well, and there are a variety of reptiles, amphibians, mammals and fish to view in elegantly displayed tanks. Highlights on the first floor include active seals in a vertical cylindrical tube, pen-guins “flying” overhead, playful otters with two daily feeding times, and a vibrant transparent specimen display. An Amazonian-themed Aqua Safari, complete with a rainforest canopy and wood-finished tanks, precedes the Living Ocean tanks which showcase giant sand tiger sharks, swarms of small fish in bait balls, and sea turtles. A spectacular underwater “shark” tunnel leads visitors to the touch pool where children can enjoy touching rays and handling starfish. 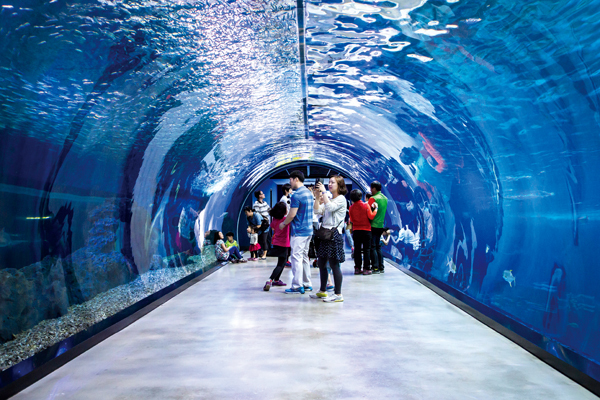 The main tank, with a 23 x 8.5 meter acrylic viewing panel, is a breathtaking display named the Ocean of Jeju. The enormous tank is impressively teaming with native fish species, giant grouper fish, hammerhead sharks, and manta rays. 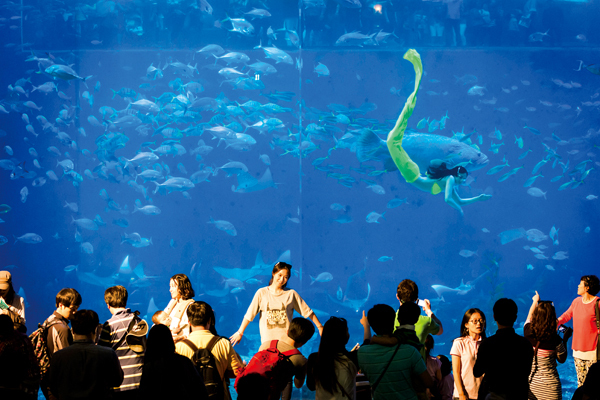 While at the main tank, catch one of the four daily diving shows in tribute to Jeju's “haenyeo,” or diving women. Also, be sure to make your way to the Ocean Arena area to watch the ecology presen-tation and synchronized swimming performance. 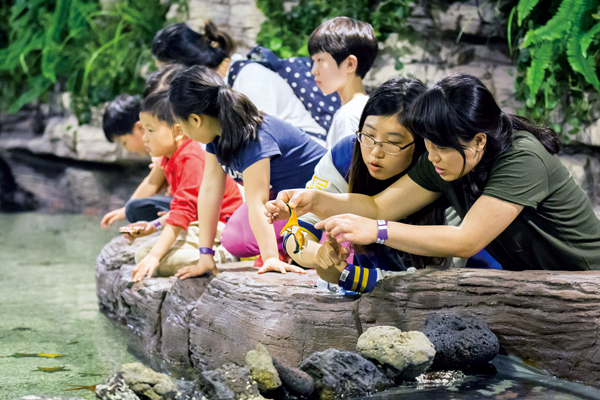 The Kiz Planet in the Marine Science area is perfect for children to learn more about the ocean and there are also places to grab a bite to eat, buy stuffed animals and ocean-themed gifts, or just rest. On the whole, Aqua Planet gives the public a truly captivating experience of what life is like in the ocean and visitors will come away more knowledgeable about marine life and the importance of conserving and protecting the ocean. 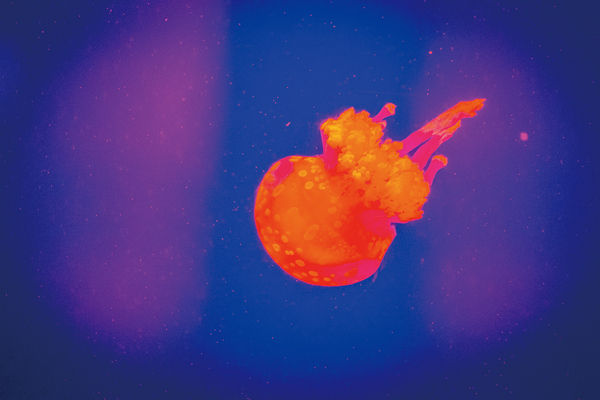 To coin a phrase: Darling it’s better, down where it’s wetter, at Hanwha Aqua Planet Jeju! *30 percent discount for Jeju residents.